President Trump tweeted Sunday morning that he will be reviewing the case of a former U.S. Army Green Beret who has been charged with the murder of a suspected Taliban bomb maker, suggesting that the president may be considering granting a pardon. The charges against Major Matthew Golsteyn, announced last week by U.S. Army Special Operations Command, follow multiple investigations into his role in the 2010 death of an Afghan man whose killing he admitted to Fox News during a 2016 interview. The death occurred while Golsteyn was on deployment in with an Army Special Forces unit in Helmand Province in Southern Afghanistan . 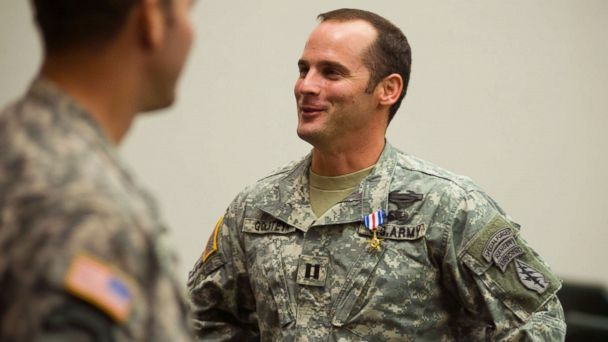 "Major Matthew Golsteyn's immediate commander has determined that sufficient evidence exists to warrant the preferral of charges against him," said Lt. Col. Loren Bymer, a spokesman for U.S. Army Special Operations Command, in a statement last week. Golsteyn has been charged with premeditated murder, a charge that could result in the death penalty if he is convicted. A later review of the alleged killing by an Army Review Board resulted in Golsteyn leaving the Army in 2015 with a general discharge. The Army investigation into the alleged incident was triggered following Golsteyn's October 2016 appearance on Fox News, in which he said that he had killed the man during his deployment.